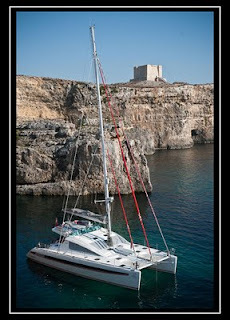 The yacht catamaran, Bella Principessa is a brand new (2009) Privilege 615. Beautifully appointed, this spacious yacht features a fully air conditioned stylish interior. Light and airy this yacht offers a large owners cabin and 2 aft cabins, all king size staterooms, each ensuite with head and spa shower. While most yachts of this size offer 4 guest cabins, Bella Principessa offers a considerable amount of space and privacy. Besides the roomy cockpit and a galley that is spacious and fully equipped, the Bella Principessa has a fly bridge which offers guests a great place to view the crystal blue waters from. Enjoy sunbathing and/or relaxing on the incredibly large foredeck and trampolines.